Google Analytics is a tool that many beginner bloggers, online store owners, and website owners tend to underutilize. In today’s digital age, data and information are absolutely essential if you want to have a successful website. As a website owner, you should definitely have Google Analytics installed on your website. We’ve written a step-by-step guide so you can install it without much trouble. But before we do that, let’s take a look at what Google Analytics is all about and why it’s so important in the first place. If you already know about Google Analytics, you can skip straight to the guide below. In a nutshell, Google Analytics is a free website tracking tool that collects data on a website, such as conversions, website traffic, user behaviour, and so much more. It’s definitely one of the most popular data tracking services currently available. The purpose of Google Analytics is to provide you with data that you can use to extract useful information, such as how much traffic your website receives and where it’s coming from, and how users behave when they are on your website. With Google Analytics, you can also export all of that data in multiple formats (i.e, excel, docs, pdf, etc.) or even build your own custom dashboard that gives feeds you with the information that you need. What Makes Google Analytics Essential? When one creates a WordPress website, one usually has a goal in mind. For a blogger, it could be the things you’re passionate about. For a business, it might be starting an online store. Or maybe you just want a website to share content with people. Regardless of the reason, you want to get people to visit your website, and to do that, you’ll need to understand your audience. Where your visitors come from, what kind of content they prefer, or even which page they’d like to visit – all these information can be used to see what works and what you can focus on to further improve your website. With Google Analytics, you can see which content on your website resonates with your visitors. From there, you can improve your blog by planning your content or articles around areas or topics that your readers want. While there are plenty of benefits to using Google Analytics, the biggest benefit is that it’s free. 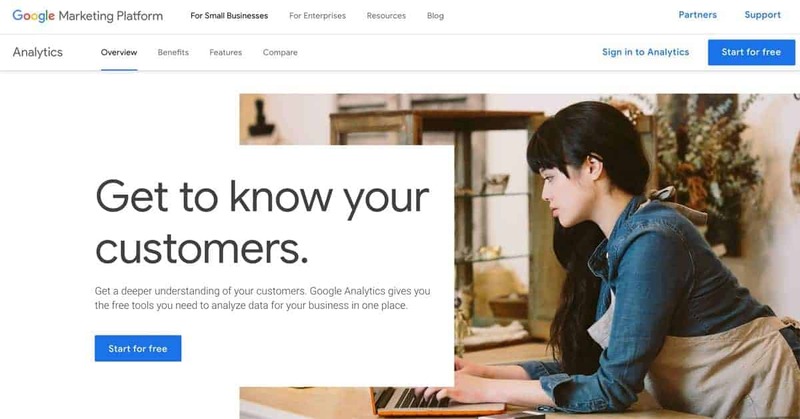 Whether you’re keen to learn about analytics or not, it doesn’t hurt to have Google Analytics running in the background, collecting data for your website. What Metrics Do You Need To Observe? For newbies, understand all the data from Google Analytics can be a wee bit overwhelming. To help you out, we’ve listed out some of the key data that you should keep an eye out for when using it. Tracks where your visitors are coming from (i.e. Google search, direct to your site, Google ads, social media platforms, other website & etc). Tracks the number of users who loads and views your website. 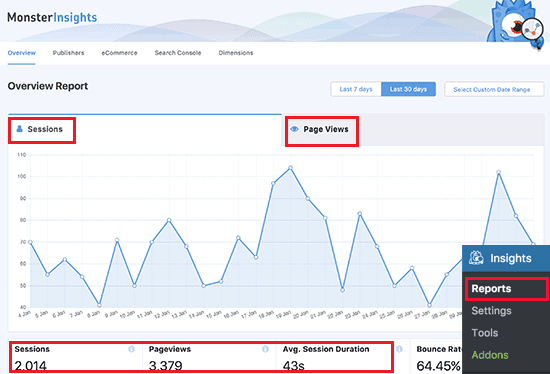 Measures and tracks the number of users that land on your pages and leaves immediately. Tracks the number of visitors your website receives. Tracks and measures the duration a user stays in your website and how many pages they visited in a session. Measures and tracks the number of visitors that completed a certain action on your site that you’ve set up. This can be anything from users filling up and submitting contact forms or signing up for registrations. Now that you’ve got the basics covered, it’s time to install Google Analytics on your WordPress website! To install Google Analytics properly, you’ll need to perform a number of steps. If you’re worried about handling codes, don’t be. We’ll guide you through all the steps so that everything will be installed properly. Let’s start with the first step! Before you can add Google Analytics to your WordPress website, you need to have a Google account first. If you don’t have one, create one here. Once you have an account, go ahead and log on to Google Analytics. You should then be prompted to create a Google Analytics account. Just follow the steps to get your account set up. With your Google Analytics account set up, you can then proceed to the next step, which is connecting it to your WordPress website. However, this can be quite confusing and overwhelming, especially if you’re a beginner or newbie. Instead, we’re going to use a plugin, which won’t require you to do any coding whatsoever. The plugin that we recommend you to use is MonsterInsights. It’s one of the most popular plugins for WordPress with over 2 million active installs and is ranked #1 as a Google Analytics plugin for WordPress. Install and activate the plugin on your WordPress account. Once it’s installed. Head over to the “Settings” panel under the “Insights” menu and click on “Authenticate with your Google Account”. You’ll then be asked to log into your Google account and then you’ll need to allow Monsterinsghts to connect to the Google Analytics account. The next step is to set up your profile with which to connect your site from. At the drop-down menu, select “All Website Data” at the website that you want to be connected, and then click on the “Complete Authentication” button. And you’re done! Google Analytics should be tracking all of your site’s data. If you want to see reports of the data, you can head to the “Reports” section of MonsterInsights. Once installed, MonsterInsights will give you a slew of information about your WordPress website under the “Reports” page. The data will be represented in charts and graphs so that it can be easily viewed and understood. In addition to that, you can also navigate across different sections of the UI to get more detailed metrics and data, such as conversion rates and trending search terms in Google. Tracking the number of page views per user session can give you an idea of how engaged your users are with your website. If they leave quickly after one page, you need to figure out how to get them to stay. Understanding the pattern of your traffic flow can help you maximize the visibility of your content. For example, if you get a lot of unique sessions during lunch hour, then posting content during that time period will get you the most views. If visitors are coming to your page from other sites, you can try to reach out to those sites to see if there’s a chance for collaboration. Knowing the percentage of your first time and repeat visitors can be useful to identify if you’re pulling enough new audiences and if you’re retaining older ones. Knowing which device your users are using to consume your content can help you to optimize your site’s design. If most of your users are on mobile devices, then having a mobile-friendly website would be a good idea. Google Analytics is a powerful tool. It’s really unfortunate that it’s severely underutilized by website owners. With the data that Google Analytics provides, you can learn and understand your audience better, which can help you improve your website in the long run. 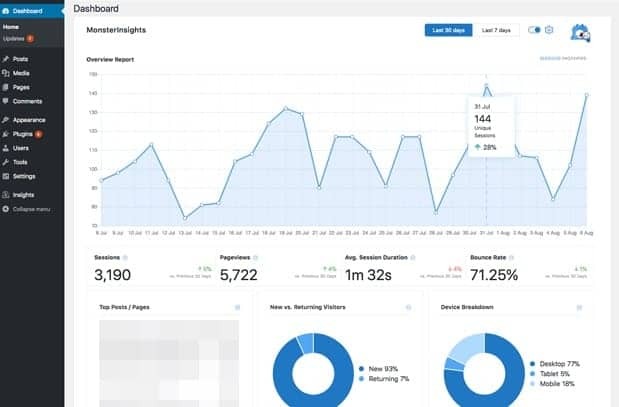 Hopefully, with this article, you’ll be able to get Google Analytics installed, giving you all the insights you need right there at your WordPress dashboard!